My dad and eight classmates graduated from Richards High School in rural Grimes County, Texas on May 22, 1941. He was 16 years old, the smallest and youngest boy in his class – but chosen to be class president. On graduation day he delivered the “welcome” to a small group of families and friends sitting inside a hot gymnasium on wooden folding chairs that were always used by the school for assemblies and special occasions. My grandmother was an archivist when it came to her three children, particularly for her youngest, my dad Glenn, and had preserved a copy of his speech on graduation day. The welcome was full of the biggest words he could think of and/or make up. Have a listen. I’m trying to picture this little 16-year-old blonde headed boy coming up with such big words and actually reading them to the farmers, cattlemen, shopkeepers, wives, mothers, other children gathered there. What were they thinking, for example, when they heard the word jollification. One person in that audience for sure loved it and wrote this letter a few days later on May 27, 1941 to her eldest child, my aunt Lucy, who was 22 years old at the time. I’m so glad that you and Terrell were able to drive up from Beaumont for Glenn’s graduation Friday night. I was so proud of his speech, weren’t you? He had wanted it to be memorable, as he phrased it. Isn’t that something? A sixteen-year-old boy wanting to be memorable. I’m sure that being the youngest and smallest in that class made him try so hard to be good at whatever he does. It certainly seemed like his other classmates were paying attention to all those big words anyway. I can’t believe my baby boy has graduated from high school. Do you remember when we moved to Richards in 1925 in the old Model T? Glenn wasn’t even two years old. Ray was five, and you were seven. Your daddy took a big chance moving us all here and opening his own barbershop. I can tell you I was afraid. But, things have a way of working out the way they’re meant to, I guess, and I couldn’t see us living anywhere else again. I had the funniest picture in my mind when Glenn was giving his speech. All those years ago when you and I were in the kitchen and I had sent the boys to bring the wood for the stove. You looked out the window and pointed at Ray pulling the wagon with the wood stacked up so high, and Glenn was riding on top while Ray struggled. You and I got so tickled. We laughed until the tears rolled down our cheeks. Well, give our love to Terrell. You are lucky to have that fine young man. Your daddy and I really think the world of him. It’s old blue Monday, and I’ve got to get moving. My uncle Ray, always the most practical and industrious of my grandmother’s three children, had this advice several days after Dad’s graduation.. I forgot to tell you when I was there for Glenn’s graduation last week, but I believe you need to raise your prices, Daddy. They’re getting 75 cents for a haircut in Houston these days and a whole dollar for a shave. And, nobody does as good a job as you do. I’m prejudiced. Got to go. I’m working overtime this week to make some extra money. Two months after the graduation, Lucy writes in July, 1941. Glenn made it down here safe and sound, and he’s going out to the college to get registered for summer school today. Don’t worry, Mama. He’ll be fine staying with us. Terrell really likes him, and I think Glenn thinks a lot of Terrell, too. I know it was sort of a hurried up decision, but he really didn’t have anything else to do this summer in Richards so he might as well go on to school and get a job here. He’s such a mess — says he’s going to borrow the money from Ray for his tuition. I told him to get a job. We’ll work it out as we go along. Saw an article about small towns in Texas in the paper the other day. Gosh, Richards is booming compared to most of them. Daddy, we can thank you for all that prosperity in Grimes County, can’t we? Your barbershop and dry cleaning business are the center of Main Street activities. Mr. McAfee’s drug store, Batey and Lenorman garages, the Borings’ picture show and café, Dr. Sanders – where would any of them be without Daddy to bring folks to town every week? Daddy fought the Depression with a razor and a pair of scissors. He didn’t need a sword. I’m so proud. Toward the end of that graduation speech in May, the youthful Glenn spoke of his hope for a future he had no way of knowing was going to be permanently altered for him and his classmates before the end of the year. This boy with his youthful optimism would find himself engaged in mortal combat as a navigator on an airplane carrying bombs for 35 missions over Germany before he was 19 years old. However, prior to his enlistment to serve his country on a battlefield in the air, he moved to Beaumont to live with his sister and her husband following his graduation from high school. Unfortunately, he wasn’t able to be home for his dad’s birthday on July 29, 1941. Beaumont was 90 miles from Richards. I wish I could be there in person to help you celebrate today. It’s the first birthday I’ve missed with you. Lucy and Terrell had planned to bring me home, but my boss at the Weingarten’s wouldn’t let me have the day off. I guess he was afraid the grocery business would go bankrupt if I wasn’t there to stock the shelves. Just know that I am with you and Mama in spirit, though. I’m sure a bunch of the old men at the barbershop kept you busy with their gossip and whittling away. How’s Mr. Howard McCune doing? How about Chili Caldwell? He’s the best one for carving animals. I fully expect his hewn cows to moo. How old are you today? I think Lucy said you were forty-three. You’re really my old man now! Sunday is Father’s Day and while I think of him every day, the holiday prompted me to spend this week with my daddy and our family through the letters they wrote. He died from colon cancer when he was 51 so I am grateful for the history my grandmother preserved. Many years ago I collected the remains of my grandmother’s and aunt’s letters, pictures and assorted papers which I planned to use in a project called A Man of Letters. 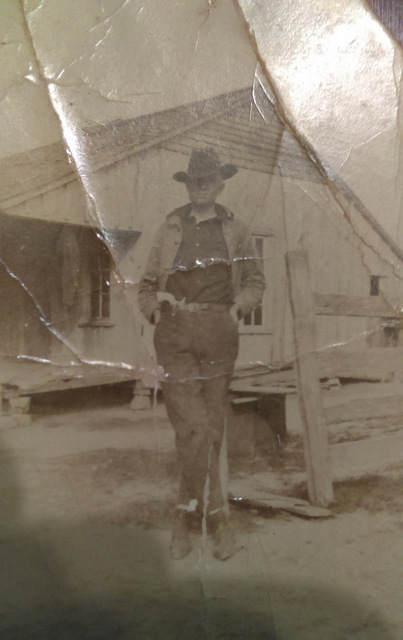 The project fizzled and languished, but I always planned to return to it because for me, this is more than a story of one man – it is a glimpse into the experiences of what family life was in rural America and how that environment nurtured the sons and daughters who became known as the Greatest Generation. 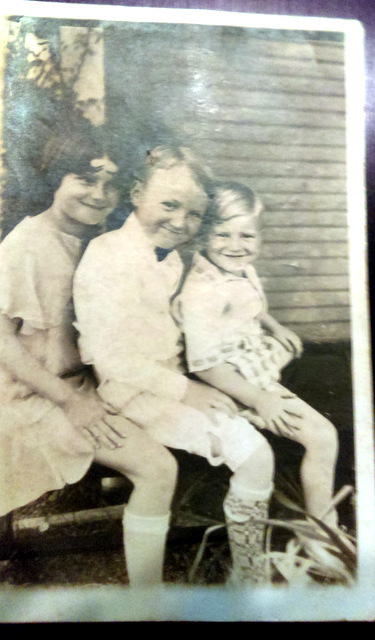 Our family survived the Great Depression with a razor and a pair of scissors but they would be tested again by the end of 1941 when the Japanese attacked Pearl Harbor creating a chain of events none of them could have foreseen. Stay tuned. 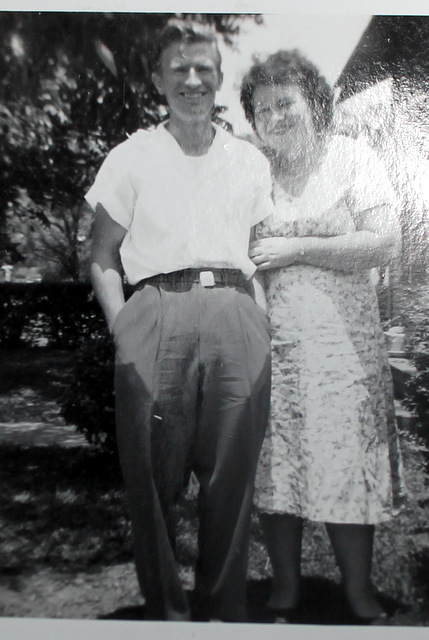 This entry was posted in Humor, Lesbian Literary, Life, Personal, politics, racism, Reflections, Slice of Life, The Way Life Is and tagged barbershop, graduation day, Great Depression Era, Pearl Harbor, small town life in Texas, WWII. Bookmark the permalink. Enjoyed reading about your dad and family! Thanks so much, Dianne – good to know you read about him!! Hope you and your family are well!! I see where your storytelling ability comes from. I think “Survived with a Razor and a Pair of Scissors” would make a good title for a book of your family history. Wasn’t that a great line?? Sheila, I’m sure you know what I think about this post. YAY!!!!!!!!!!!! Such good stuff! Your dad was a force! And I agree that that razor and pair of scissors line is fabulous. And the photos!!! I feel privileged to have been invited into the inner sanctum! Luanne, your research and work on your family has been an inspiration to me. I can’t thank you enough. Aw shucks. You’re welcome. I am so thrilled that you wrote this story. Looking forward to hearing more, do hope you pick that project back up! I am making an effort. We’ll see. Must get to work before Wimbledon!! Thank you for sharing all of this amazing family history with us! Oh I think you do just fine! 🙂 I really loved these. Thank you again for sharing.